This graph shows the change in the number of entrants to the Employment Agency in France between July 2016 and July 2017, in thousands. 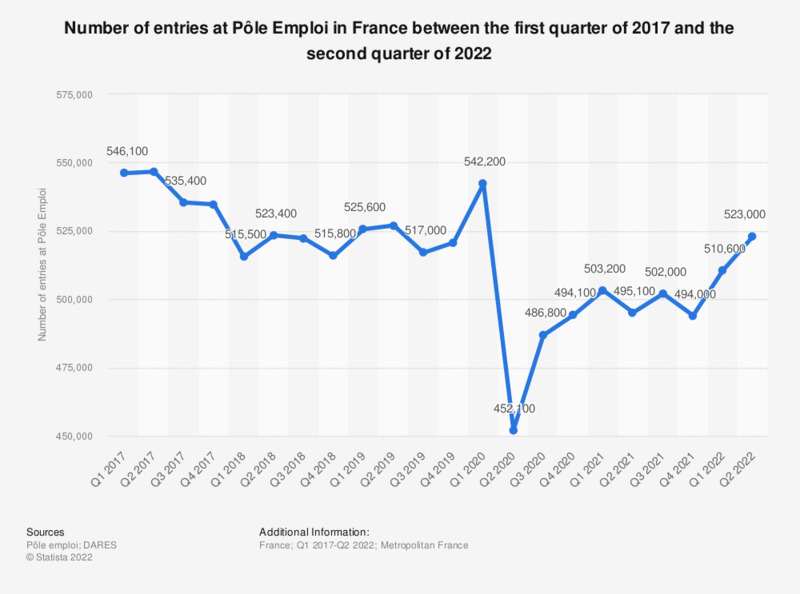 In July 2017, 583,300 people registered for the Employment Agency in France. Data include categories of job-seekers A, B and C.
Category A refers to unemployed persons required to perform positive job search, looking for a job regardless of the type of contract (permanent, fixed-term, full-time, part-time, temporary or seasonal). Category B refers to persons who have exercised a reduced activity of up to 78 hours per month, who are required to perform positive acts of job search. Category C refers to people who have had a reduced activity of more than 78 hours per month, who are required to perform positive job search actions.